In 2016 a unique development appeared on the market. This was the Carp Expert Double Speed reel. As its name suggests it is a two speed reel with a lower and higher gear ratio. You can easily match your tackle to any fishing situation by turning the drag adjusting dial on the back of the reel. Why is this useful? Firstly, in fishing it is important that our terminal tackle should stay in the water as long as possible. Secondly, the fish should be landed safely. The retrieve speed of your reel is always a top priority. When you’re retrieving your tackle, use the higher gear ratio. After you’ve changed your bait, your terminal tackle can go back to your feed. However, when you’re playing the fish choose the lower gear ratio to put more tension on the carp or grass carp on your hook. 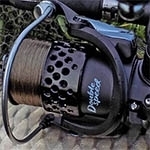 You can use this reel for feeder or carp fishing. Compared to traditional reels, with the Double Speed you can achieve longer distances thanks to the elongated spool. In some cases the success of fishing might depend on only a few meters. The structure of the reel and the quality materials used in the production process make the Double Speed an outstanding fishing equipment for advanced anglers. It features a metal handle, lightened metal spool (with a graphite spare spool) and a solid metal body. Those who are receptive to new ideas and innovations and want to be more successful in fishing should not miss this opportunity of getting an excellent reel with a perfect bait runner system for non-predatory fish. Metal spools are becoming widespread, thanks to their outstanding durability. The classical spool of this reel provides an attractive appearance. What's more, you're given two spare graphite spools. The reel has a stunning front drag system that can be adjusted on a large scale. The large drag washers guarantee outstanding smoothness, which might be the key to big fish catches. The popularity of baitrunner reels is increasing. They play an important role in predator fishing and night fishing. On the one hand, this practical reel type helps fish swallow the bait properly. On the other hand, it prevents fish from pulling the rod into the water. You can set the baitrunner clutch with the screw on the back. Before setting the hook, the baitrunner clutch should always be disengaged. Similarly, when playing fish, only the main clutch should be used. Nowadays this reel type is widely used in feeder fishing. Second gear: CXP Double Speed on the test!